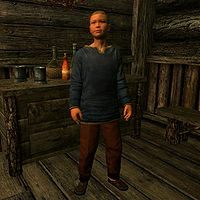 Francois Beaufort is an Imperial child who lives in the Honorhall Orphanage in Riften. His parents left him at the orphanage around a year prior to the events of the game, and he is waiting for them to return and collect him, as they promised him they would. However, it's likely he was abandoned. He approves of Aventus Aretino's plans to summon the Dark Brotherhood, and hopes Grelod the Kind will be killed. Once she is, he cheers with joy along with the other orphans. He then resumes his normal schedule: he gets up at 6am and stays in the orphanage building. He heads to the yard at 10am, playing with the other children for one hour before returning inside. At 3pm he is allowed to eat for one hour, and goes to bed at 10pm. He wears child's clothes and a pair of shoes. He carries a selection of food and toys, and a small amount of gold. Before you kill Grelod, he will tell you, "I do hope mummy and father come to get me soon. Ever since that Aventus boy left, Grelod has been so angry. ", "My parents dropped me off here a year ago. But they're coming back to get me. They said so." or "You look kind of scary. But nobody is scarier than old Grelod." If Constance Michel is alive, he will also say, "Constance Michel says we have to be careful of people we don't know." If you have not talked to Aventus Aretino, you can ask Francois to tell you more about him: "Oh, Aventus Aretino. He was sent here when his mother died, but he ran away." If Grelod is alive, he will continue by saying, "I heard he went back to his house in Windhelm, and is trying to get the Dark Brotherhood to come and murder Grelod. That would be so wonderful." If not, he will instead say, "I heard he went back to his house in Windhelm, to try and get the Dark Brotherhood to come and murder Grelod. And... he actually pulled it off!" When asked about Grelod, he will respond, "Miss Grelod is... well she's a terrible old crone. No person could be that cruel. I think she's part hagraven. She only lets us out in the yard once. In the morning. And she just stands there watching us. Like I said. Hagraven." He will be overjoyed to see the cruel headmistress die, as he'll exclaim, "Oh my goodness! ", "We love you, Dark Brotherhood! Ha ha ha ha ha!" or "Yay!" Before you return to Aventus, Francois will also express his disbelief: "I can't believe it! Grelod is dead! She's really dead!" If you murdered Grelod before going to Aventus, he will comment, "I do hope mummy and father come to get me soon. Ever since that Aventus boy left, this place has gone mad."